After much deliberation among your leadership team, a vision has been formed and a business case has been validated. You know what you want and how much you want to spend. Your project must be completed, but you can’t afford to increase direct staff overhead for a project-oriented need with a short duration. You conclude that outsourcing to project management professionals serves the best interest of your organization. Urban Equities deploys a project team that partners with you to establish an efficient process that will result in your success. Our staff owns these directives and we drive execution of your strategy…….consistent with your scope, schedule and budget. We deliver end-to-end project & construction management services during the preconstruction and construction phases for your fixed-asset and capital projects. To support this effort, our team, in part, taps our national network of construction contractors, fixture installers, refrigeration installers, and suppliers. We have the capacity to cover the continental U.S. and Puerto Rico. 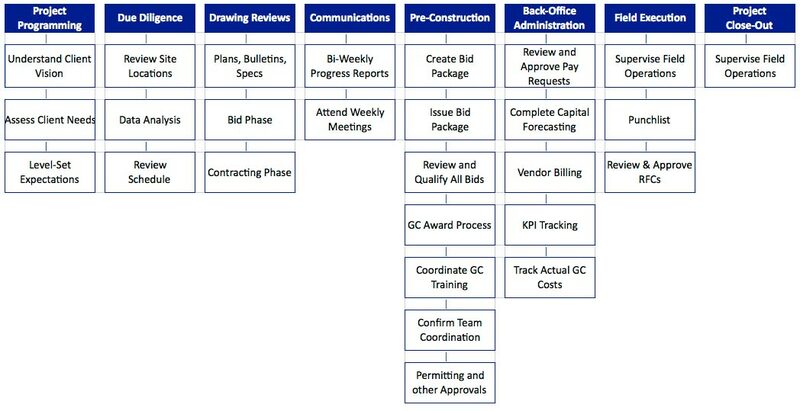 The matrix below describes our process and illustrates a menu of service solutions that equip the client with the ability to integrate our services during critical work streams, thereby reducing risks and optimizing speed-to-market opportunities.